Saffron Tree: Mood swings - Books on Wind and its moods for every age! Mood swings - Books on Wind and its moods for every age! Oh Wind! Where are you? Sh-sh-sh-sh, answers the Wind, and he stirs one dry leaf to show where he is. A small boy, a list of fun things, and the friendly breeze thrown in – what more to lift the spirits in a child? Sketches using just three colors, the illustrations more than “capture” the invisible friend for us. Personifying wind with all its temperaments opens up a relationship even for us . Winner of several awards, Mary Hall Ets enables this very gently, playfully and beautifully. 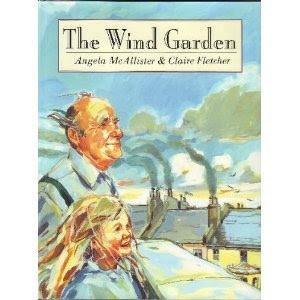 The finesse that is evident in the narration probably comes from authoring many dozens of books for Angela McAllister. And Claire Fletcher’s sweeping illustrations of oil paintings in soothing colors (of the invigorated wind, windy places and windblown things) mesh perfectly well! Ellie pots a few seeds on a city rooftop for old Grandpa who misses walking in the park. But the wind stifles the sprouts. She even tries the strongly stemmed sunflowers. But again the wind ruins it all, crushing Ellie’s desire for a rooftop garden. This leaves an upset Ellie wondering why the wind would do such a thing. But the night she spends at Grandpa’s, something magical happens - she is airlifted and deposited on a lush mountaintop. There she sees a big tree festooned with everything that the wind has carried away for itself, like balloons, lost laundry, Ellie’s lost kite, hats and hankies! Back to reality, Ellie knows what to do. She sets up a wind garden for Grandpa. The two string together windmills, flags and bells. And when the wind blows, it glitters, chimes, shines, rustles, swings and shimmers, enough to make Grandpa very happy! We surge and soar with the wind blowing in every mood in every poem. From rocking a cradle to lifting people off the ground! Snatching things away and rattling doors. 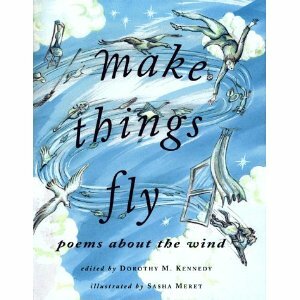 There is also a poem for every kind of wind - a tornado, the May wind, the autumn wind and wind on the hill. The poems are all simple and sized right. There is a pleasing variety that encompasses the different ways in which wind manifests and affects. Sasha Meret’s line drawings in sepia carry the apt quality of imagination and dynamism. flying so high in the sky? that made little children cry. why do I feel the wind in my hand? that I give to a child of the land. Meera, through the gentle breeze of your reviews, the amazing flavours of the books have wafted right upto my nose, making me want to sample them right away ! Such a treat of all flavours Meera. Great picks. The second book -aah. The entire rooftop (iron frame + sheets) of our gazebo on the terrace was airlifted and plonked by the wind far away. Enough to demonstrate the power of the wind in a way that one owuld neverforget! Thanking all the Folks Up There there was no one about! Thanks M, will look out for the books. The first one reminds me of Balloon by Jez Alborough - another awesome book for wee ones where the wind plays with the child’s balloon. Lovely picks, Meera, esp. the last one. Will certainly go searching for this one. Anything for delectable poetry! Have experienced the awesomeness of a blizzard- the power and fearfulness of an element in the raw!